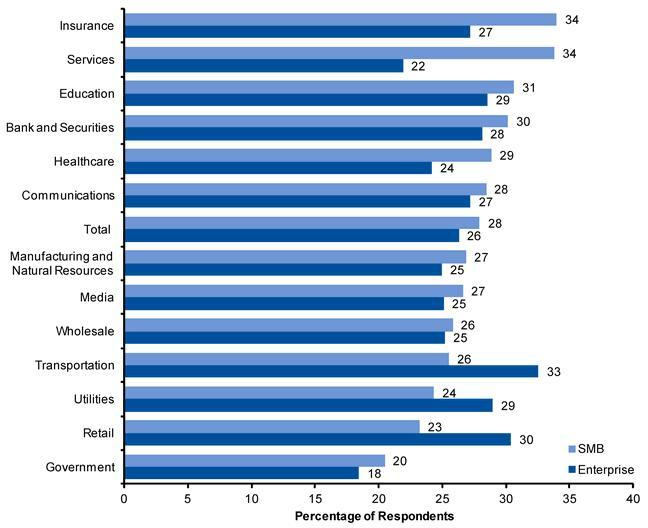 27% of all inquiries are from banking, finance and insurance industries, followed by manufacturing (14%), government (13%), services (10%) and healthcare (8%). North America (75.9%) and EMEA (13.5%) are the two most dominant geographies in terms of query volume. 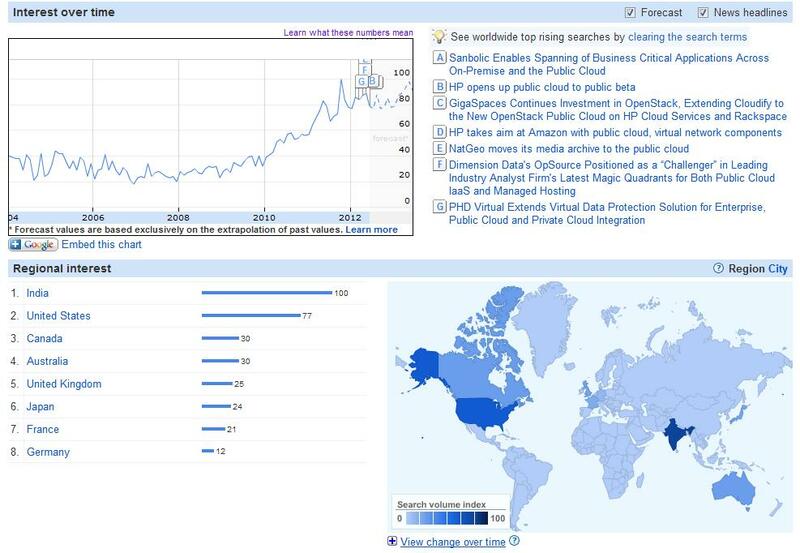 What’s driving Hadoop’s meteoric rise in searches is a combination of industry hype about big data, CIOs getting serious about using Hadoop distributions that minimize time and risk yet deliver value, and the dominant role Amazon is playing in bringing Hadoop into the cloud. Today Amazon offers Elastic MapReduce as a Web Service that relies on a hosted Hadoop framework running the Elastic Compute Cloud (EC2) in conjunction with Amazon Simple Storage Service (S2). Microsoft also scored a major hiring win this week announcing that Raghu Ramakrishnan, former chief scientist for three divisions of Yahoo is now with Microsoft. Raghu is now a technical fellow working in the Server and Tools Business (STB). He’ll focus on big data and integration to STB platforms. 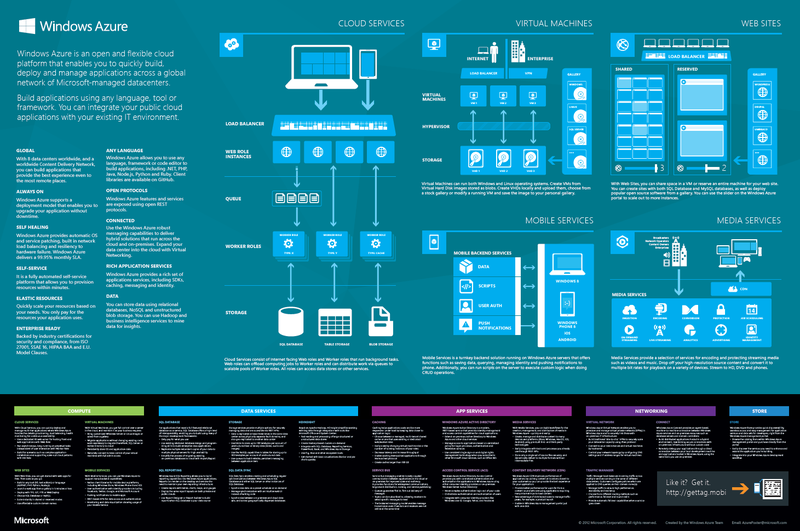 Big Data on Azure will accelerate now with him on-board. 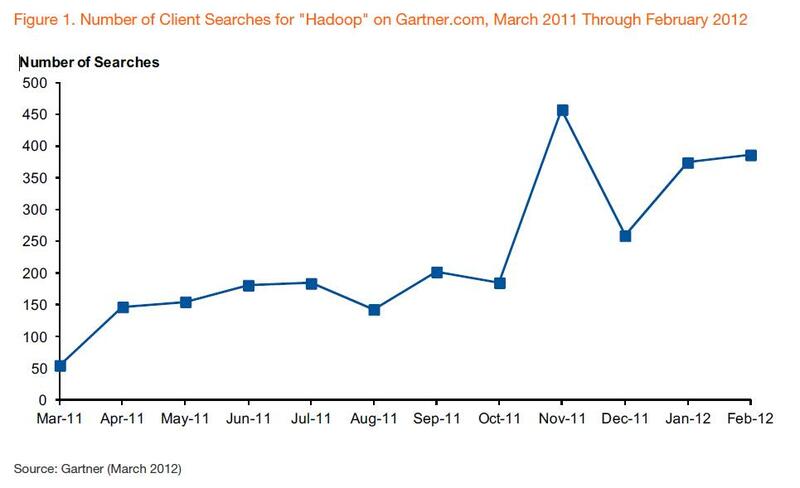 The quickening pace of Hadoop adoption in the enterprise is good news for CRM and especially social CRM. Analytics and Business Intelligence (BI) are the “glue” that unify CRM and keep it in context. One of Hadoop’s greatest potential contributions is the analysis, categorization and use of unstructured content. Marketing and sales won’t have to run three or four systems to gain insights into customer data, they can run a single analytics platform that fuels the entire selling cycle and lifetime customer value chain of their businesses. Hadoop has the potential to make unstructured content more meaningful while also reporting the impact of customer insights on financial performance, profitability and lifetime customer value. Translating terabytes of customer, sales, services and partner data into meaningful analytics and business intelligence (BI) is emerging as a priority for CIOs, who are sharing responsibility for driving top-line revenue growth. 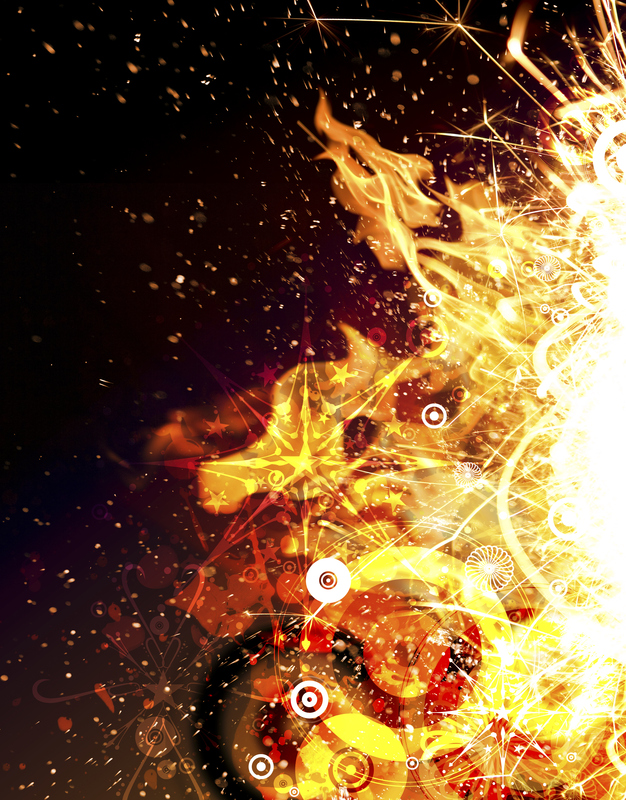 Hadoop shows potential to be the “glue” or galvanizing technology base that unifies all CRM and Social CRM strategies. 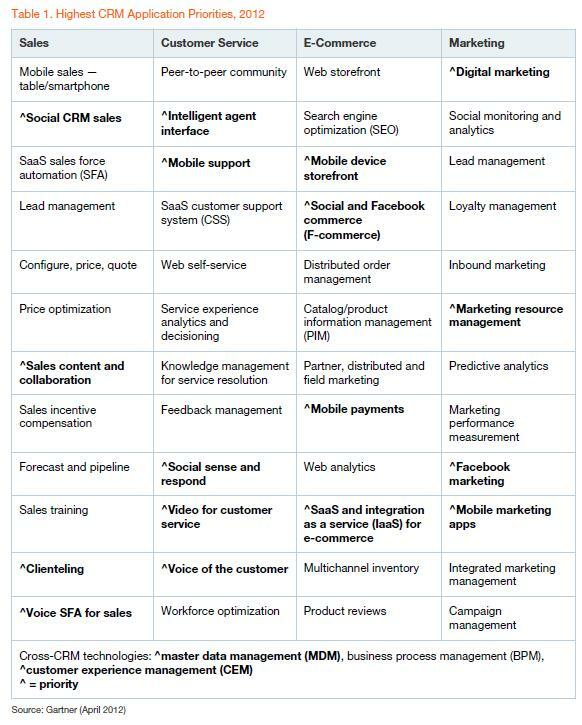 Bottom line: CRM and Social CRM will benefit more than any other area of an enterprise as Hadoop’s adoption continues to accelerate. 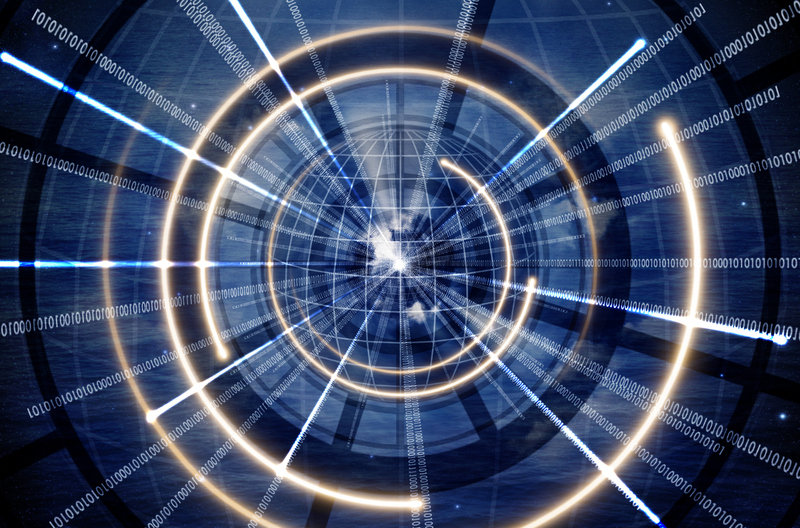 CIOs are increasingly called upon to be strategists, and with the ability to translate terabytes of data into strategies that deliver dollars, look for Hadoop’s contributions to drive top-line revenue growth. 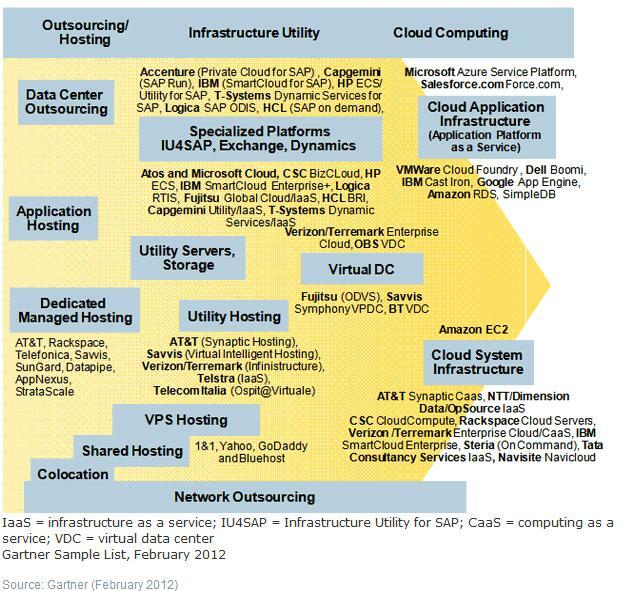 The latest round of cloud computing forecasts released by Cisco, Deloitte, IDC, Forrester, Gartner, The 451 Group and others show how rapidly cloud computing’s adoption in enterprises is happening. 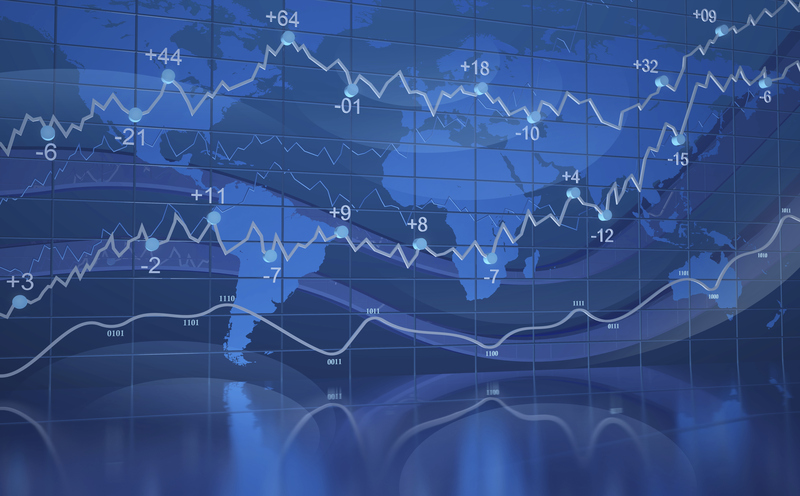 The better forecasts quantify just how and where adoption is and isn’t occurring and why. Overall, this year’s forecasts have taken into account enterprise constraints more realistically than prior years, yielding a more reasonable set of market estimates. 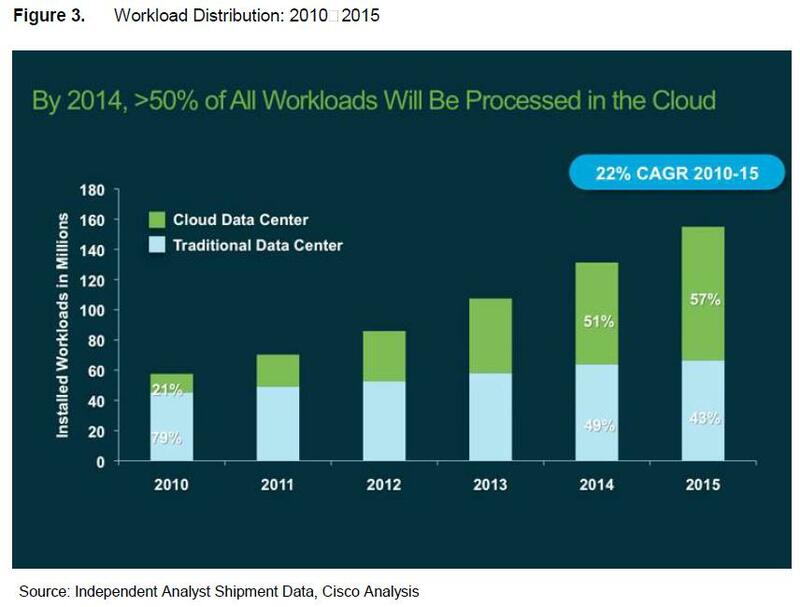 There still is much hype surrounding cloud computing forecasts as can be seen from some of the huge growth rates and market size estimates. With the direction of forecasting by vertical market and process area however, constraints are making the market estimates more realistic. 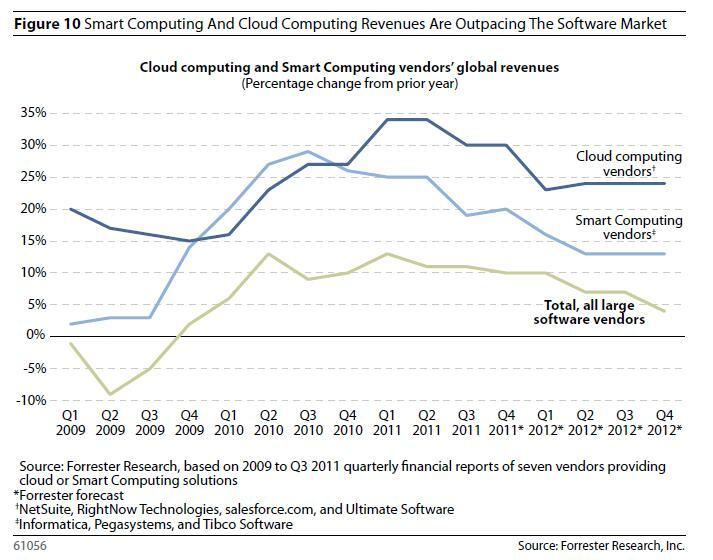 Forrester forecasts that the global market for cloud computing will grow from $40.7 billion in 2011 to more than $241 billion in 2020. 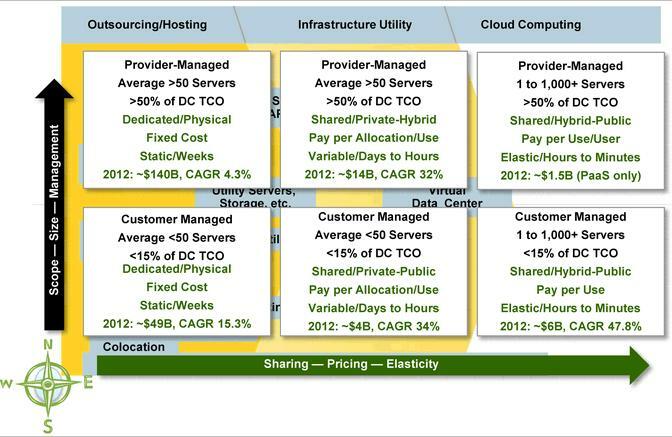 The total size of the public cloud market will grow from $25.5 billion in 2011 to $159.3 billion in 2020. 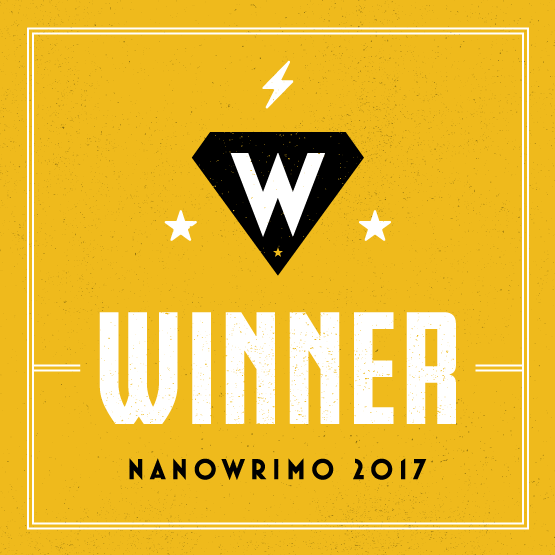 Link to report excerpt is here. 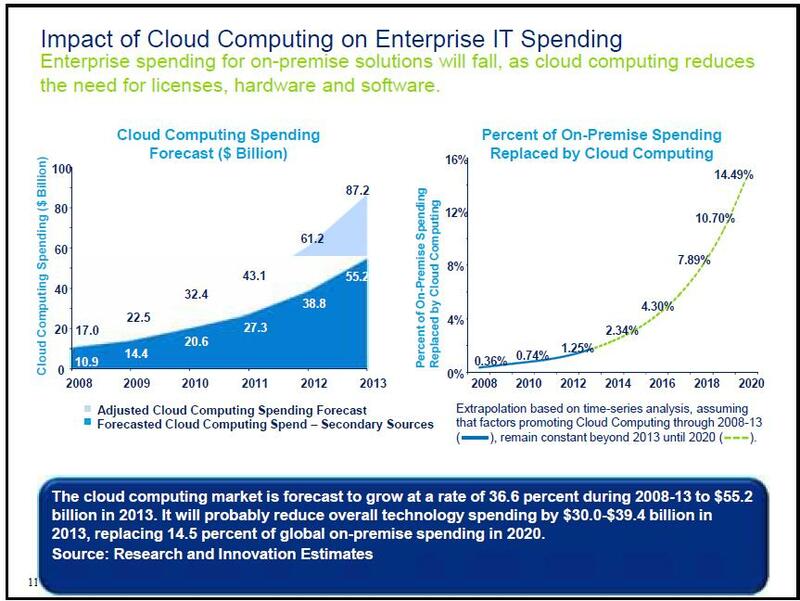 Deloitte is predicting cloud-based applications will replace 2.34% of enterprise IT spending in 2014 rising 14.49% in 2020. 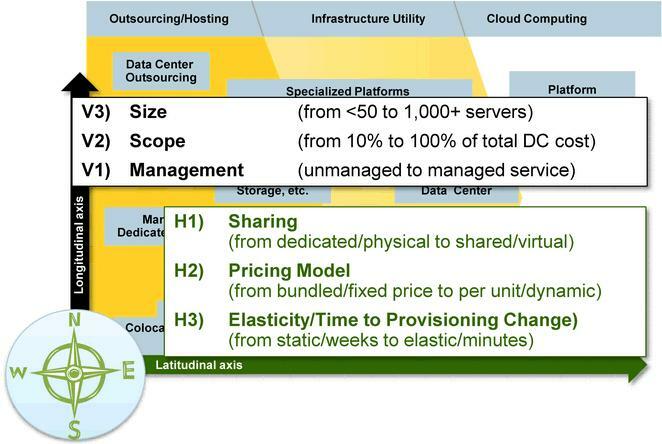 The slide below is from an excellent presentation by Deloitte titled Cloud Computing Forecast Change downloadable from this link. 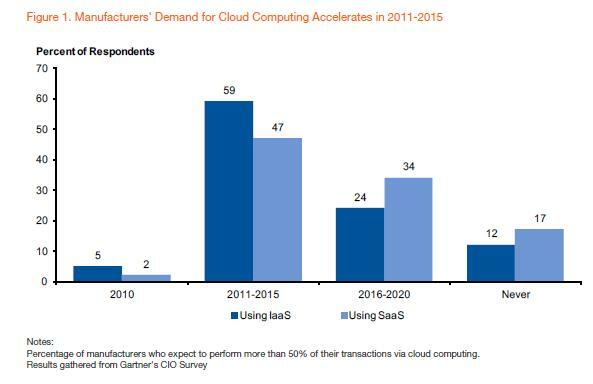 Gartner is predicting that the cloud system infrastructure (cloud IaaS) market to grow by 47.8% through 2015. The research firm advises outsourcers not moving in that direction that consolidation and cannibalization will occur in the 2013 – 2014 timeframe The providers named most often by respondents were Amazon (34%), SunGard (30%) and Verizon Business (30%). 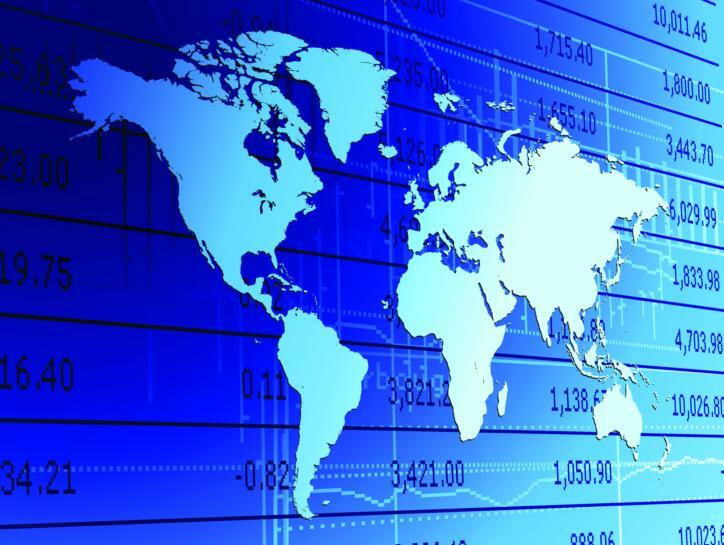 Of the global top 10 IT outsourcing market leaders, only CSC appears on the list. 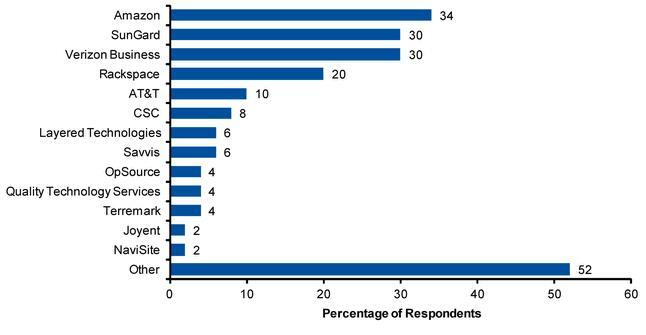 Source: User Survey Analysis: Infrastructure as a Service, the 2011 Uptake Claudio Da Rold, Allie Young. 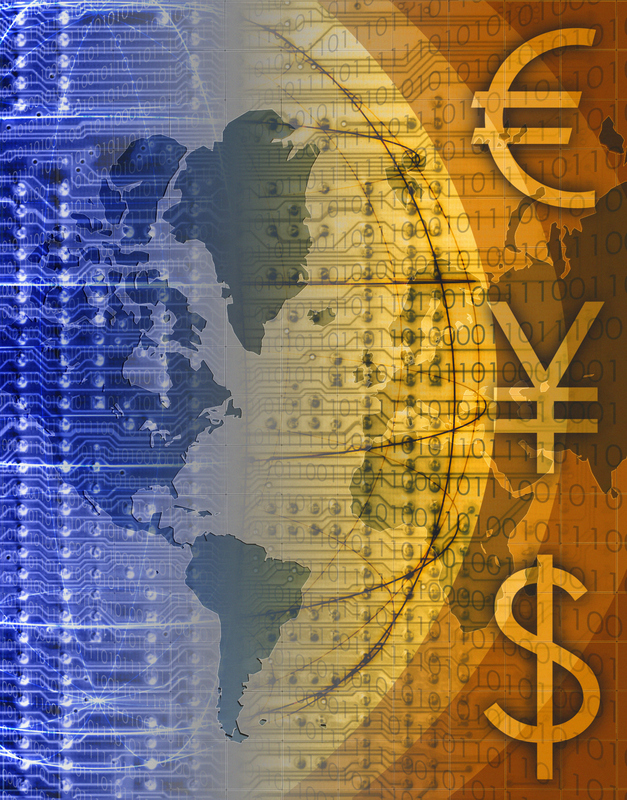 The majority of loan provider applications are cloud-based and his company is running NetSuite. His corporate office is in Asia and cloud-based applications made it possible for the company to launch and operate in California within months. He’s been given six months to transform this mobile vision into reality. Another CIO of a major A&D manufacturer I recently visited wants vendors to challenge him more to get greater value from his investments in legacy data and ERP systems. Using ERP to run batch reports alone has nearly caused project schedules to slip, so the focus internally is on real-time system integration of project management and accounting systems. He’s also been given the task of revamping accounting and financial systems by October, 2012, and they just started late last year. 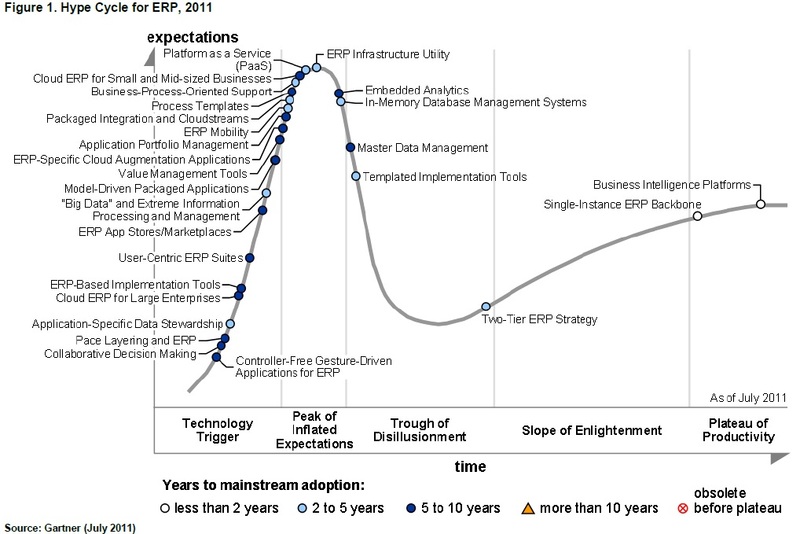 Considering these two extremes in the context of the Gartner Hype Cycle for ERP (shown below) and the recent report SaaS and Cloud ERP Trends, Observations, and Performance 2011 (free for download until January 9, 2012) published by Aberdeen last month several take-aways emerge. 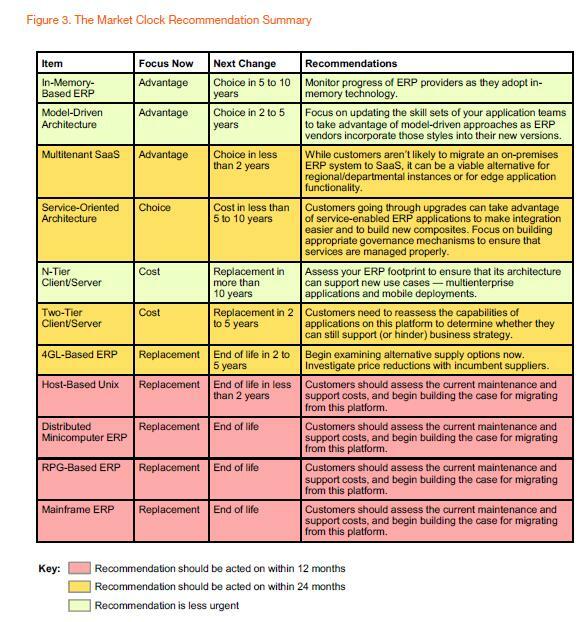 CIOs are under increasing pressure in 2012 to enhance, modify even replace existing ERP systems while standardizing technology across the enterprise at the same time. The most risk-averse way around this is to add applications to single instance ERP backbone systems, with analytics and Business Intelligence (BI) being the among the most in demand. 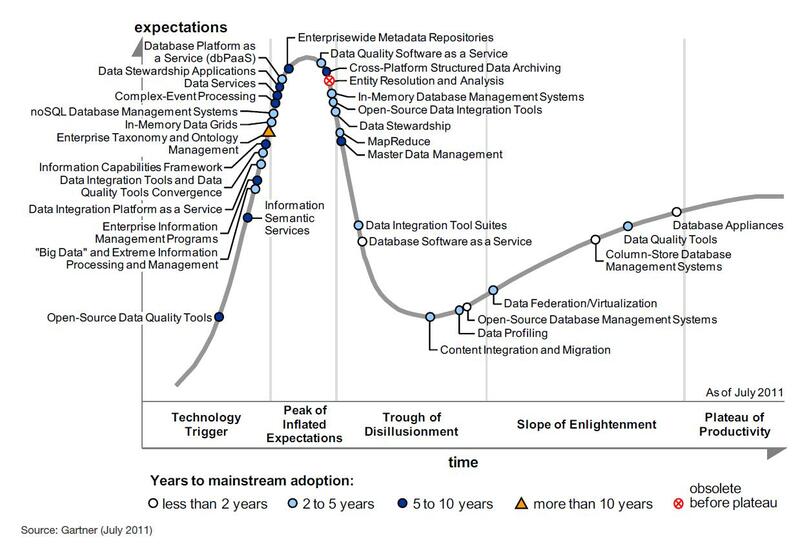 Cloud-based ERP in the Enterprise and Small & Medium Businesses (SMB) are accelerating along the Hype Cycle faster than Gartner indicates. Enterprises are using Cloud-based ERP systems as part of their two-tier ERP system strategies due to the Total Cost of Ownership (TCO) and time-to-deploy advantages, and the flexibility of tailoring everything from user interfaces to workflows to their specific requirements. Highly specialized Cloud-based ERP suites including those from Plex Systems are gaining traction due to their expertise in specific industries and the compliance-related challenges inherent within them. In SMBs, the cost and time-to-deploy are two major drivers with concerns over security being the biggest impediment to growth. 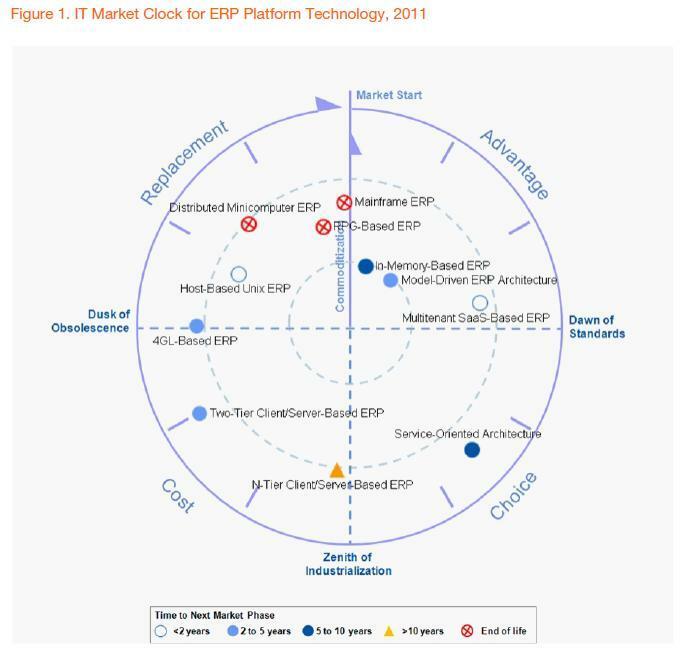 Gartner reports that they are seeing Cloud-based ERP adoption fastest in companies with fewer than 200 users overall. Cloud-based ERP systems most often considered in industries that have high variable costs, rapid transaction cycles and tend towards higher Return on Invested Capital (ROIC). 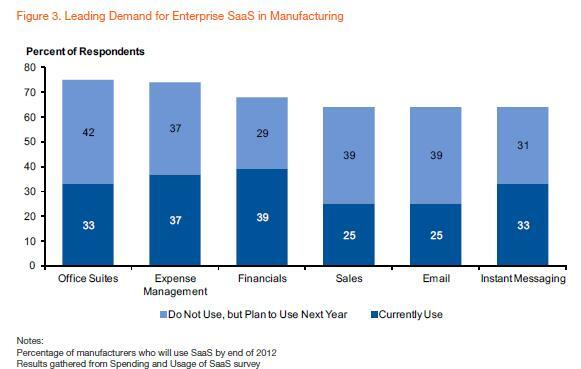 Based on the research SaaS and Cloud ERP Trends, Observations, and Performance 2011 the industries who are the most willing to consider Cloud-based ERP versus on-premise are Financial Services (22% SaaS versus 44% on-premise); Healthcare (42% SaaS versus 58% on-premise); and Professional Services (56% SaaS versus 58% on-premise). ERP mobility will be a dominant force from the shop floor to each sales call where quotes, orders and contracts deliver real-time order and pricing updates. 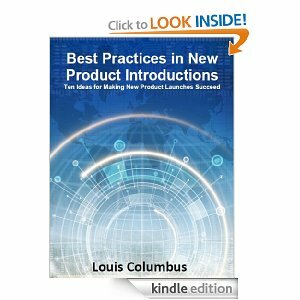 How a given manufacturer chooses to sell is even more important than what they sell in many industries. Equipping manufacturing, quality assurance, production scheduling, procurement and sales to have immediate data on what’s going on with orders, customers and suppliers is critical. 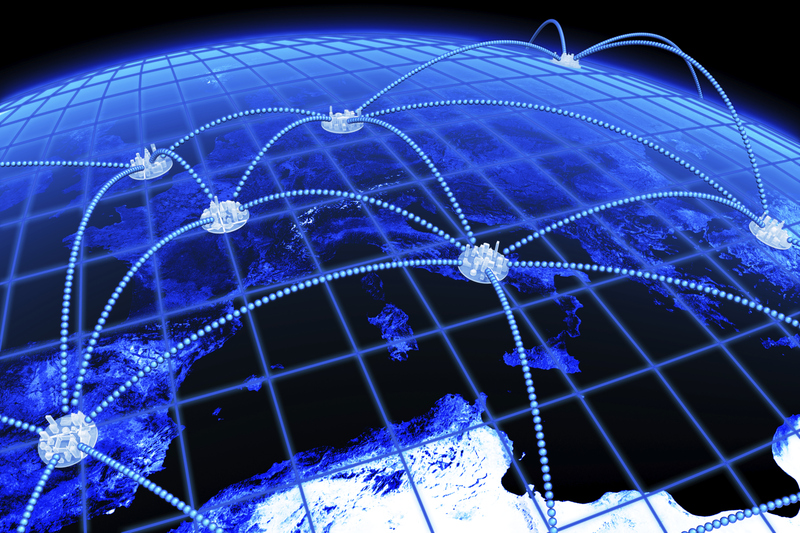 For the sales and service teams, real-time data is the fuel they run on. There’s a chronic time shortage in many, many companies right now, and bringing greater ERP mobility from the shop floor to the sales call will increasingly be seen as a means to lessen the time crunch. 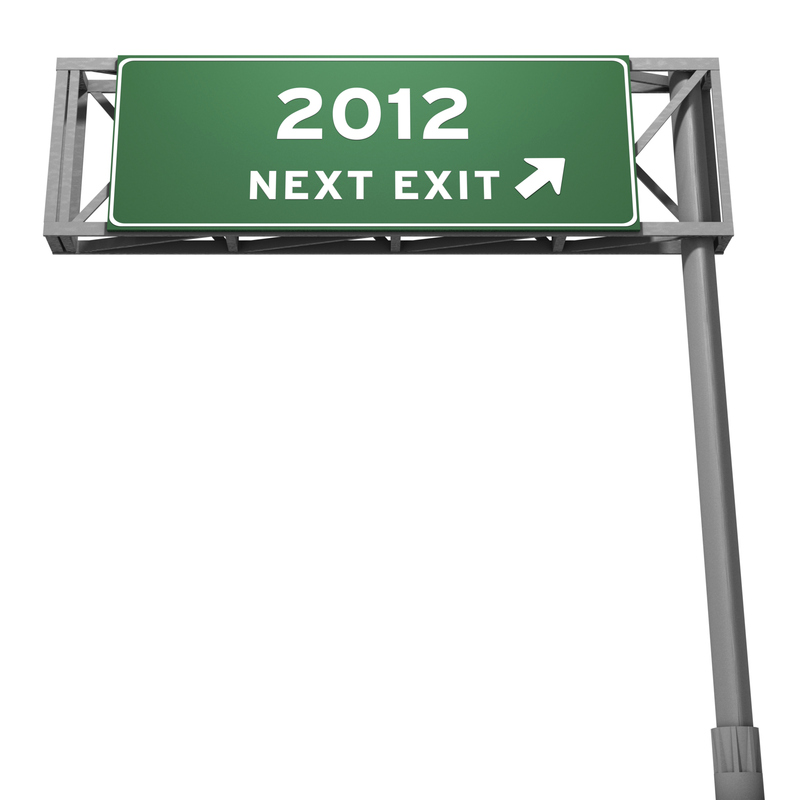 2012 is the year where mobility gets real across the enterprise with solid performance numbers being generated as a result. For companies with large sales forces and service organizations, integrating to key ERP systems to gain real-time data will quickly lead to increased sales and higher gross margins on service and warranty repairs. Gartner predicts that by 2015 enterprises who are successfully using extreme information management strategies (Big Data) will outperform competitors in their industry sectors by 20% in every available financial metric. 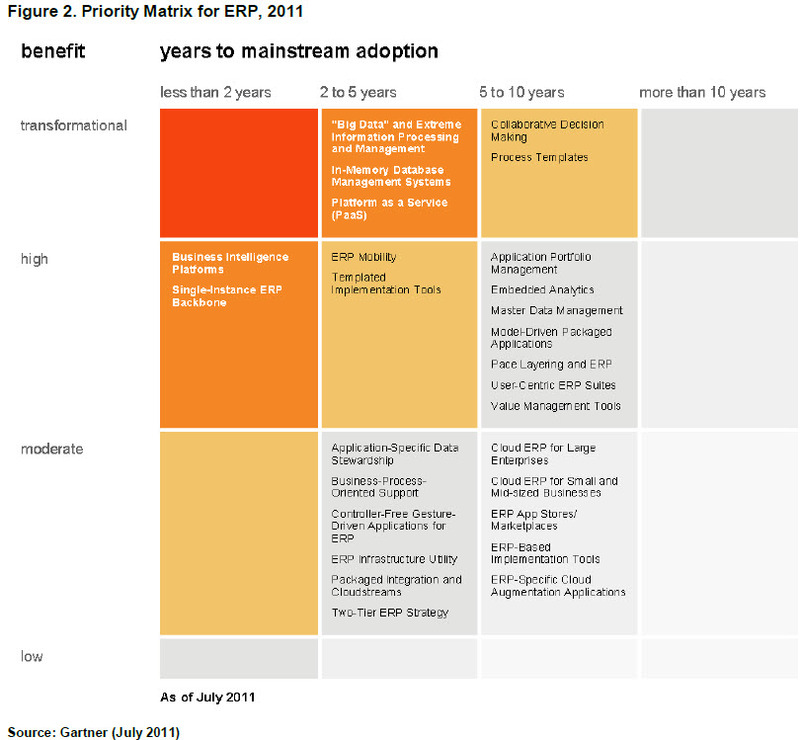 The following is the Priority Matrix for ERP, 2011 showing what Gartner believes to be transformational technologies and strategies in ERP.